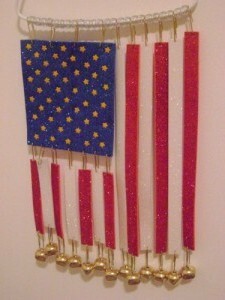 This pretty little wind chime is much easier to make than I would have thought. 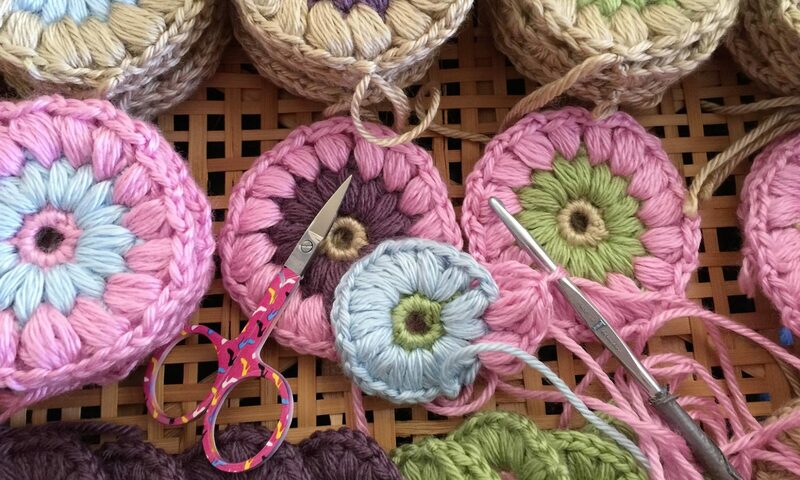 And you know how I feel about doing really hard stuff–and calling it crafting. Don’t like it one little bit. So, please trust me when I say this one is fun, fast and pretty dang easy…or it wouldn’t be here. 1. Cut out a 4 1/2- by 4-inch blue craft foam rectangle. Punch 4 evenly spaced holes on one of the long sides of the rectangle and 7 on the other. 2. Space the brads or stars evenly on the blue rectangle. 3. Cut out 7 red craft foam strips: three 1/2 by 8 inches, four 1/2 by 3 1/2 inches. 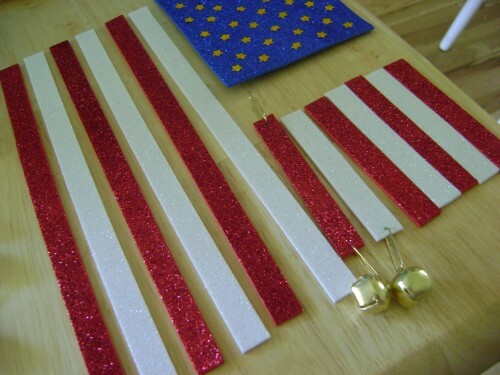 Cut out 6 white craft foam strips: three 1/2 by 8 inches and three 1/2 by 3 1/2 inches. 4. 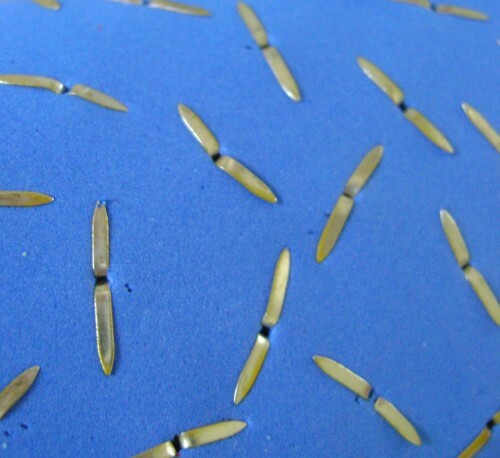 Punch holes in both ends of all of the strips and thread paper clips through all the holes. 5. Attach the 7 short strips to the bottom of the blue square. Thread 4 paper clips through the holes at the top of the blue square. 6. 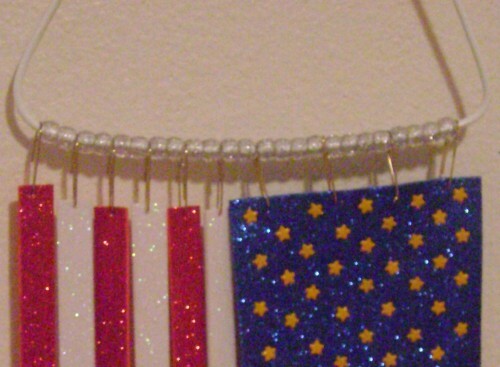 Slide all the pieces onto the hanger–with 2 or 4 beads between–to form the flag. 7. 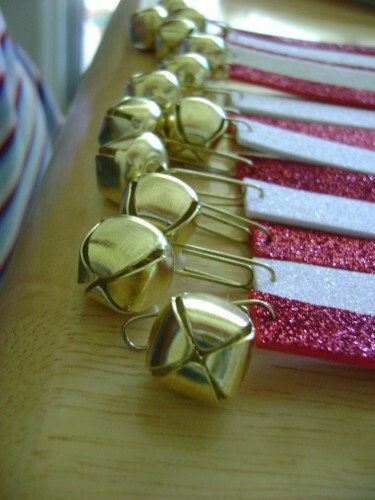 Attach a bell to the clip on each strip. 8. Shape the hanger into a triangle shape and tie curly ribbon at the top. 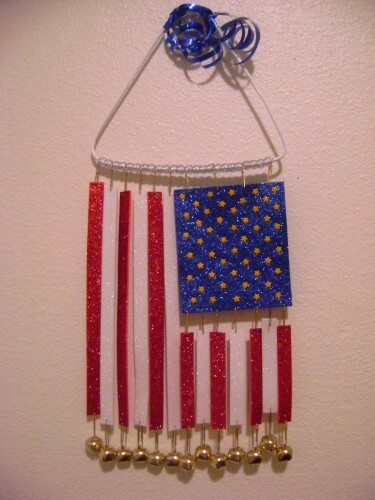 I LOVE Patriotic things, and this one is SUPER cute! 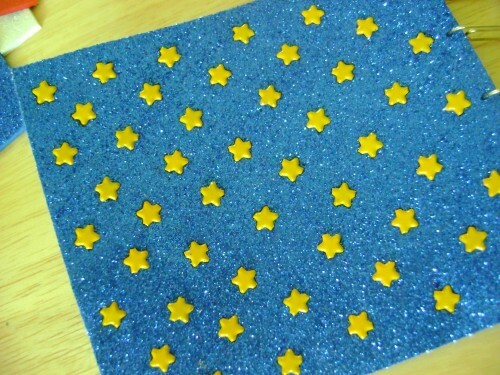 I love that you found sparkly foam too! SOOO great! Really cute! 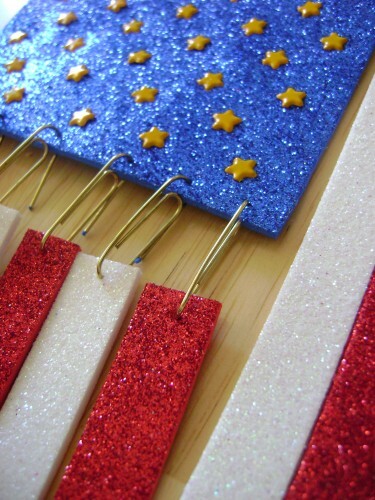 John would love for me to make this for 4th of July. Now the questions is…where will I find the time? Holy cow–thanks so much for telling that. I saw this craft done a bit differently somewhere else and it totally bugged me because the way they had it hanging looked so wrong to me. But according to the link you sent–they were totally right. 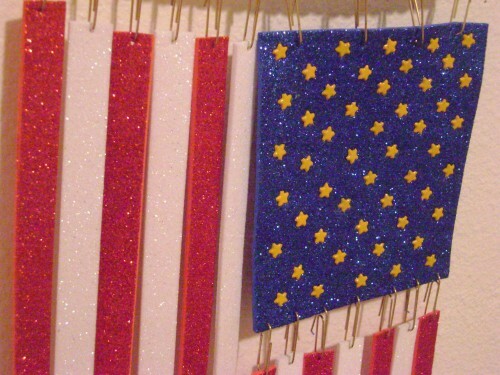 The way I was doing it was that if it was flying in the yard this is how it would hang. I had no idea that if you hang it straight down you turn it around so that the blue is still on the left. My craft is only one sided so I’ll need to take it apart to fix it. Be patient for a few days and I’ll get it corrected. Seriously–thank you so much for teaching me some flag etiquette. That helps us all.